Twenty-nine South Dakota agricultural industry professionals and producers took a break from the long chill of winter to travel to Chile on Feb. 11-20. The individuals were a part of the South Dakota Agricultural and Rural Leadership (SDARL) Program, a private, non-profit organization dedicated to identifying and developing leadership for agriculture and rural communities in order to enhance the quality of life for all South Dakotans. 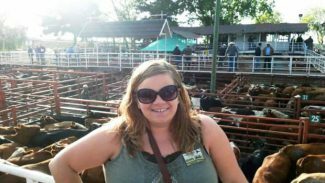 Cayla Christiansen, agricultural education instructor and FFA advisor in Platte, SD, was one of the members of the SDARL class, which is an 18-month comprehensive program that explores local, state, national and global agriculture. She recapped the SDARL experience and shared stories from the group's trip to Chile. "In Chile, we toured everything from fruit farms, to feedlots, to livestock auction markets, to vineyards, to orphanages," she said. "It was a whirlwind trip that exposed us to many different aspects of Chile. In some areas, it seemed like the country was 10-15 years behind us, but in other areas, they are very advanced and progressive in the way they do things." Kurt Zuehlke, a custom cattle feeder, stocker, and farmer from Britton, SD, served as president for this year's SDARL class. He, too, reflected on the trip to Chile. 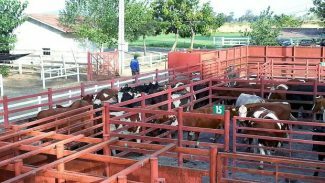 Both Zuehlke and Christiansen agreed the stop at the livestock auction market and feedlots were big highlights of the trip. "The big difference I noticed at the auction market was the cattle are sold as single entries, with two rings and two auctioneers selling the lots at alternating times," Zuehlke said. "Instead of a ring man standing in the ring moving the cattle, a guy stood a little bit above the ring and moved the calves with a long bamboo stick. Fat cattle there were selling at about 95¢/lb. compared to our $1.40/lb. in some areas back home." "When we went to the livestock auction, we noticed that there were people standing above us during the sale," Christiansen recalled. "There was a grandpa, a dad, and a son, showing us that agriculture is a family affair involving multiple generations no matter where you go. It's the same as home, even from 5,000 miles away. Rural people are the same wherever you go, too. People are so friendly and welcoming; it felt a lot like home." The feedlot tour showcased Angus, Simmental and Hereford genetics, but they both noticed the cattle had a leaner appearance than what folks are used to seeing in the U.S.
"It was interesting to see the different breeds of cattle and their feeding programs, as well," Christiansen said. 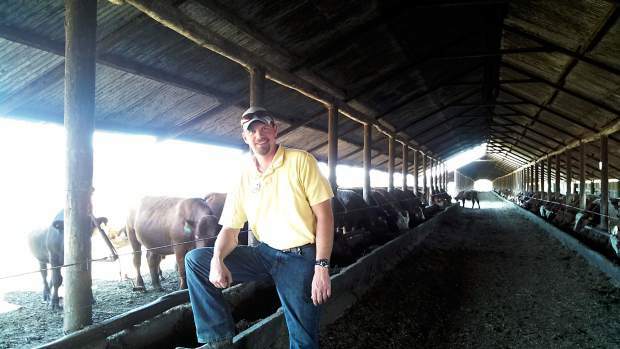 "They fed rye grass bales and a different type of corn silage than I'm used to seeing. They feed under a slanted roof because, when they aren't in a drought, they get a lot of rain." "Most of the cattle are grass-fed, but the ones fed in a finishing feedlot were fed about 6.5 lbs. of corn/day, compared to our 17-20 lbs./day in some feedlots," Zuehlke noted. "They gain anywhere from 2.8-3.2 lbs./day and are mostly fed a coarse, long roughage of rye silage." Zuehlke also observed that the beef had a distinctive flavor much different from the corn-fed beef he was used to eating back home in South Dakota. "It's certainly much leaner, with a grass-fed flavor, less marbling and has a different appearance on the plate," he said. "It's not bad; it's just a different flavor. The first meals I ate back home were a burger and a steak; I was happy to have some U.S. beef again. Another thing that was interesting was 50% of Chile's meat is domestically raised, with some coming from Brazil and Argentina. The livestock producers in Chile are very optimistic, which correlates to how many ranchers feel back home, as well." Christiansen blogged about her experiences on the trip to Chile at http://www.travelingteach.wordpress.com. Folks interested can read in further detail about each stop on their exciting international trip. Looking back on the last 18-months, Christiansen reflected on all that she has learned and gained from the SDARL experience. "Getting to explore all of the many segments of agriculture in the state was really great," she said. "I learned a lot about the sheep industry and the wool market, as well as the forestry business and the sawmills — these were things I didn't know much about previously. I plan to take these experiences back to my classroom and teach my students about the many different facets of agriculture and agricultural opportunities there are right here in the state of South Dakota." In addition to several stops across the state, the group also visited Washington, D.C. Another aspect of the SDARL program is regular meetings, networking opportunities, debates, reading material and an all-encompassing, intensive lesson plan of how agriculture works. "I can't really put a price on the experience," said Christiansen. "For someone who is thinking about doing SDARL, there are 200 alumni and seven previous classes to look back on. These folks have worked things out with chores, their spouses, their kids, and their other commitments to make things work. The skills you learn and the ideas you get are invaluable to your operation." "If anyone is interested in agriculture, leadership and politics, I highly recommend SDARL," added Zuehkle. "The entire experience helped me realize how fast the food industry is and how small our world really is. It was truly a once-in-a-lifetime opportunity."